Kentucky is now the 44th state in the country to allow charter schools! + 1. Public charter schools are an attempt to privatize schools and make a profit. Every single charter school in America, without exception, is a tuition-free public school. Charter schools are publicly funded by local, state, and federal tax dollars based on student enrollment, just like all other public schools. Charter schools expand public school options for families that may be dissatisfied with their local schools, but cannot afford private school. In the Kentucky law, public charter schools are public schools, and charter school governing boards must be sworn in and adhere to the same open meeting laws, requests for public records, and conflicts of interests and ethics requirements, just like all public schools. Public charter schools must also follow all federal laws for serving special education students, Limited English Learners, bilingual students and gifted students. Public charter schools must take the K-PREP, align their curriculum to the state standards and follow all state accountability measures. As public schools, charter schools are not allowed to charge tuition or have admissions requirements, and they must follow the same non-discrimination laws when enrolling students. + 2. Charter schools will take only the highest performing students. Charter public schools are open to all students, regardless of past academic performance. Every charter school must have a fair and open admission process. Because they are free and open to all, charter schools can never engage in selective admissions policies. When enrollment requests exceed the number of seats, charter schools are required by law to hold a public lottery to determine who will attend. 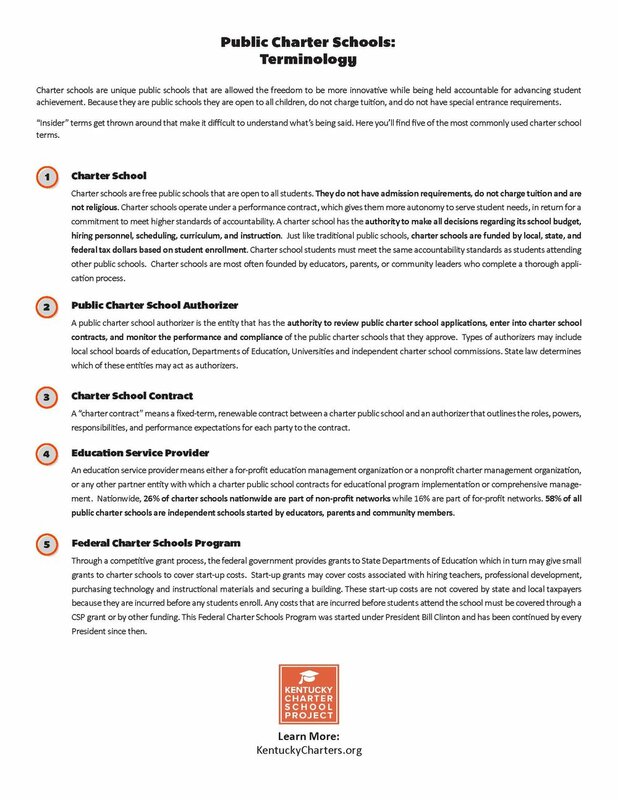 Like other public schools, charter schools are legally mandated to be non-sectarian and non-discriminatory in their admission practices. Charter schools are always and only schools of choice. No student can be assigned to a charter school. So if a student is happy at his/her schools and among the top performing students of his/her class, why would they want to leave? + 3. Charter schools will kill teaching jobs in our town. Public charter schools offer educators another professional opportunity. In some cases, a public charter schools may even create new teaching and school support positions. The Kentucky law requires the same licensing and standards for teachers, so the same job market will have more jobs in it. The Kentucky law also allows teachers to take an approved leave of absence from the school district to teach in a public charter school. After three years, the teacher must decide to either stay with the district or work in the public charter school. + 4. Charter schools underperform public schools, so what's the point? This is simply untrue. Reputable and gold-standard research makes it clear that public charter schools improve academic outcomes for kids the longer a student stays enrolled in the public charter school. A comprehensive 2013 national study of public charter schools by Stanford University’s Center for Research on Education Outcomes (CREDO) showed positive learning gains for students in public charter schools compared with students in district-run public schools. The effect was particularly strong among minority students from low-income backgrounds, English Learners, and students with disabilities. A 2014 study from Mathematic Policy Research showed that public charter school graduates are more likely to stay in college and have higher earnings in early adulthood. A 2015 study on the performance of urban charter schools shows that public charter school students in large cities gained the equivalent of 40 additional days of learning in math and 28 additional days in reading compared to their district-run public school peers. + 5. Public charter schools let unqualified teachers teach, and they underpay them too. The Kentucky law has very clear language stating that a local school district cannot force an educator to teach in a public charter school. The Kentucky law requires the same licensing and professional standards for teachers, including the same alternative pathways to certification available to all public school teachers. In the Kentucky law, public charter schools will have the option to pay teachers more and create teacher incentive pay if the budget allows for it. + 6. Does the performance of charter schools raise or lower the performance of a district as a whole? Historically, research on charter school performance has focused on whether public charter schools improved the educational achievement of students enrolled in them. This clearly matters to students and families choosing among school options. But it’s not the only bar as the public charter school movement grows and reaches maturity. In several cities where traditional districts perform below state averages – Boston, Detroit, Indianapolis, Flint, St. Louis, Memphis and Nashville – charters appear to be producing strong enough learning growth to close the gap for children who remain in them for several years. In Cleveland, Detroit, Miami and Milwaukee, public charter schools are producing enough greater learning gains that district performance as a whole is improving. It is important to note that public charter school performance varies across cities and states, according to the strength of a state law and how well it’s implemented. + 7. How do we make sure that charter schools don’t take only the best students? The Kentucky law makes it very clear that public charter schools must follow all non-discrimination laws, the same as all public schools. The law also clearly states that public charter schools cannot discriminate on any basis. It outlines very specific steps to enroll a student and does not allow any public charter schools to have admission requirements. The Kentucky law requires all public charter schools to report to the Department of Education its student enrollment numbers, including the number of special education students, African American students, Hispanic students and students eligible for free and reduced lunch. Transparency is key. Each year, to monitor the public charter school program, a report on student enrollment and performance must be prepared by the Department of Education and reported to the Education Committees, State Board of Education and Governor’s office. + 8. What about funding? I don’t want my district to be affected. Public charter schools are formed by teachers, parents, community leaders and business leaders, who must comply with a stringent application process in order to receive a charter to open the school. In many small rural communities in Kentucky, people are happy with their schools just as they are. This is not to say a public charter school could not be started in small rural areas, but it would be less likely than in larger, more populated areas. Should a public charter school be approved to open, the only funding that will go to a public charter school will be the per-pupil allocations for that child who chooses to attend that school. Public education dollars are allocated to educate students, not to maintain a district’s administration.